Creating old world charm or a contemporary flare to your walkway or patio is simple with the help of Blooms Landcare. 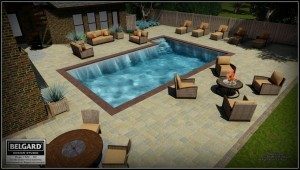 Here you can find a number of options of pavers, including driveway pavers, concrete pavers, brick pavers and more. Our team can help you create an attention-grabbing driveway, patio or walkway. Our pavers are offered in a number of tones, shapes and styles to help you create the right charm and personality to transform your outdoor living spaces. In addition to outstanding style, Blooms Landcare’s concrete brick pavers have been designed to be durable, strong and eco-friendly, ensuring your patio or driveway will withstand the test of time. Blooms Landcare specializes in high quality paver installation. What distinguishes us from other paving companies is our highly trained staff. We hold several certifications, including certifications from ICPI and Techniseal. ICPI certification ensures that our concrete pavers have all the necessary knowledge to produce a top-tier product while complying with all industry guidelines. Techniseal Certified Applicator Program is a specialized course on cleaning, sealing, and joint stabilization of pavers. We invest heavily in our pavers in order to bring our clients the best end result possible.